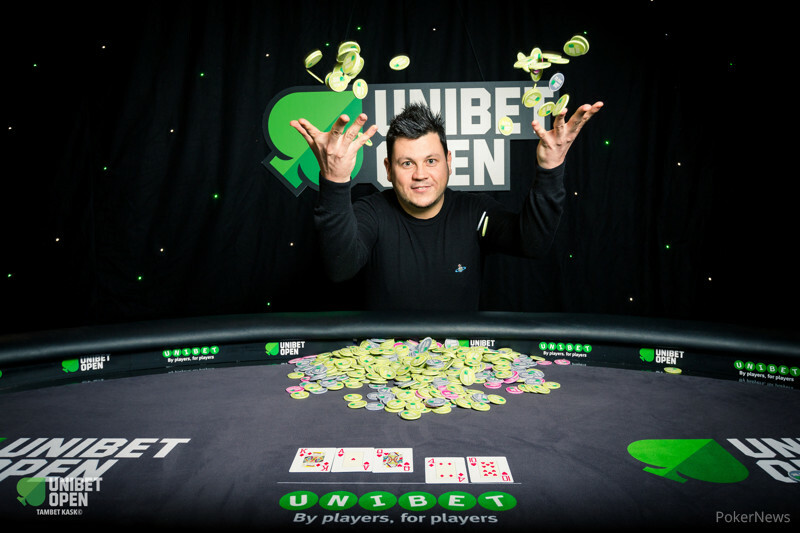 After approximately six hours of play on the final table, the United Kingdom's David Shallow emerged as the winner of the Unibet Open London Main Event for £62,000 and the coveted trophy. Shallow now exceeds the half-million mark in career live tournament earnings after the victory. The Main Event victory marks the third-biggest win for Shallow in his poker career, as he previous won the World Poker Tour Dublin Main Event for €222,280 in January 2012 and shipped the UKIPT Nottingham High Roller in May 2014 for £68,000. The day began with eight of the nine players in their seats, and Shallow joined a few hands late. Not too far into the day, the man holding the shortest stack starting today's action, China's Jin Hui, was eliminated in ninth place for £6,300. Hui's top pair on the turn with the proved no match for Bhavin Khatri's flopped set of eights. Play continued for over two hours before the next player was eliminated. France's Nicolas Ludwicki hit the rail after falling short on chips a few hands earlier. Then, Shallow went from being a short stack to no longer "shallow" in chips when his preflop all-in shove for 850,000 with the — at blinds of 25,000/50,000 and an ante of 5,000 — flushed the board against Khatri's . Shortly after, Hungary's Akos Gergely (7th - £10,540), France's Benjamin Lebor (6th - £12,670), and Hungary's Mate Mecs (5th - £15,770) exited the tournament in very quick succession. France's Julien Rouxel, who began the day as chip leader, was the next player eliminated in fourth place for £21,005 at the hands of fellow countryman Nicolas Cardyn. While it was Cardyn who finished him off, Rouxel was already short after losing a big hand against Khatri, in which Khatri flopped a set with the on a board. Rouxel had the and took the lead with the nut flush on the turn. But, the final blow was delivered to Rouxel when the paired the board on the river to give Khatri a full house. Not too long after that, the tournament was heads up after Cardyn lost a key hand. He went all in preflop with the and lost to Shallow's after the appeared on the flop. Cardyn collected £28,190 for his third-place finish. Khatri began heads-up play with 7.155 million in chips and a small lead against Shallow's 5.485 million. Khatri's advantage became slightly greater during the beginning of heads-up play thanks to taking down a few small pots in a row, but eventually Shallow turned the tables with a couple of big pots. During the final hand, Khatri raised the action to 240,000 with the . Shallow three-bet to 665,000 with the , and Khatri called. Shallow then led out for a bet of 740,000 with two pair on a flop of . Khatri then went all in for 3.3 million holding just top pair, and Shallow promptly called. The on the turn and the on the river didn't improve Khatri's hand, eliminating him in second place for £42,500. 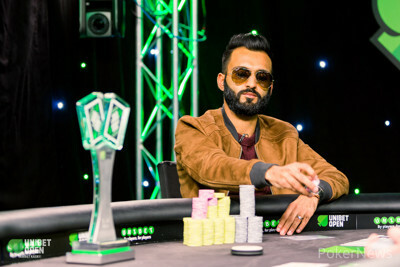 Khatri shared with PokerNews that he qualified into the Unibet Open London Main Event for around £100. Bhavin Khatri raises the action to 240,000 chips with . David Shallow three-bet the action to 665,000 chips and Khatri called. Shallow leads out for a bet of 740,000 with two pair on a flop of . Khatri then went all-in for 3.3 million and Shallow promptly called. The on the turn and the on the river didn't improve Khatri's hand, eliminating him in second place for £42,500. 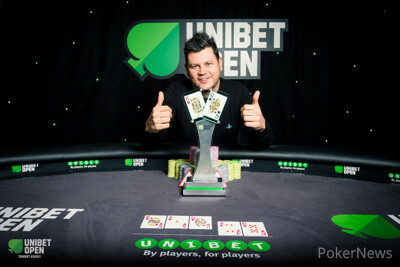 Shallow collected a cool £62,000 along with the winner's trophy after turning things around quickly in heads-up play. David Shallow raises the action to 200,000 with Bhavin Khatri called with from the big blind. Khatri checked the action to Shallow on a flop of . Shallow bets 225,000 with his over-pair and Khatri raises to 600,000 with his bottom pair. Shallow re-raised to 1.2 million and Khatri folded. After a few small pots heads-up, Shallow raises to 200,000 from the small blind with and Khatri calls from the big blind with . Both players opt to check on a flop of . On the turn came the , giving a straight to Khatri along with a gut-shot straight-flush draw and a nut flush-draw for Shallow. Khatri checks the action to Shallow who fires out a bet of 315,000. After Khatri calls, the spikes the river giving both players a flush, but a bigger one to Shallow. Bhavin Khatri folded from under the gun. David Shallow raised to 225,000 with from the small blind. Nicolas Cardyn woke up with in the big blind and went into the tank before three-betting the action to 490,000 chips. Shallow declares himself all-in for 3.1 million and Cardyn calls for his remaining 2.4 million in chips. Cardyn turned from favorite to underdog when the flop gave Shallow a pair. The French poker player was unable to catch back up when the board completed with the . Nicolas Cardyn collected £28,190 for his third place finish and setting up a British heads-up battle between Bhavin Khatri and David Shallow. 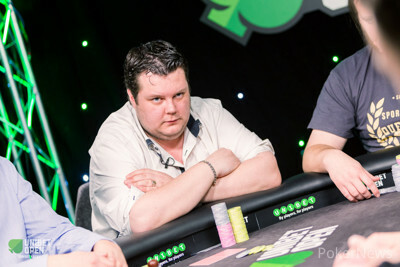 Julien Rouxel came into today's action as the final table chip leader. However, he will have to settle fourth place after this hand unfolded. Rouxel shoved all-in for 770,000 chips from under the gun with . The action folded to Nicolas Cardyn in the small blind who isolation-shoved his 1.6 million stack with and Khatri folded. The flop created some hope for Rouxel, as he had a flush draw, despite this also giving Cardyn top-pair. 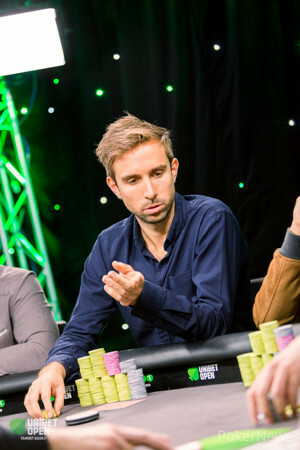 However, Rouxel's day ended with him being eliminated in fourth place for £21,005 after the board completed with the on the turn and the on the river. It didn't take long for Rouxel to get at least some of his chips back as he went all-in with . David Shallow called from the big blind with and wasn't able to get ahead of his opponent when the board ran out . Julien Rouxel raised to 125,000 from the cut-off with and Bhavin Khatri called from the big blind with . In a back and forth hand, Khatri took the lead flopping a set on a board of . Khatri checked the flop to Rouxel who bet 155,000 with a nut-flush draw. Khatri raised the action to 405,000 which Rouxel called. Rouxel completed his flush when the appeared on the turn. Khatri this time led out firing a bet of 490,000 which Rouxel called. The filled up the board giving Khatri a full-house.